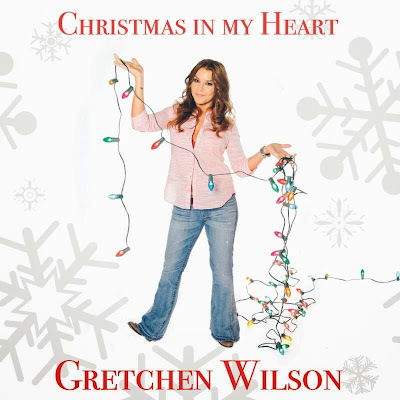 Grammy Award-winning superstar Gretchen Wilson will have a dream come true this month, when her debut Holiday album Christmas In My Heart is released on October 8, 2013. The 10-song cd will include a mix of traditional carols, holiday favorites and a few future classics. Produced by Gretchen, the new album will be the third album released this year on her Redneck Records label. "This is something I've wanted to do for a long time," said Gretchen. "We really took our time and came up with a fun mix of classic songs and found some great new songs to record." The Greg Barnhill-composed title track kicks of the album and is followed by the fun "Santa I've Been Naughty" written by Robert Simbeck and Frank Michels. The slightly irreverent "If You See Rudolph," by Trent Willmon, Jenee Fleenor and Rob Byus, rounds out the original offerings on the cd. Kids will love Gretchen's versions of "I Want A Hippopotamus For Christmas," "Have A Holly Jolly Christmas" and "Nuttin' For Christmas," and her renditions of classics like "Have Yourself A Merry Little Christmas," "Blue Christmas," "The Christmas Song" and "Silent Night" are sure to delight listeners throughout the holiday season. Christmas In My Heart was mastered using the sparkling state-of-the-art "Mastered For iTunes" format - a first for a Gretchen Wilson release - and it can be pre-ordered at iTunes here. Through her own Redneck Records label, Gretchen released a new Country album entitled Right On Time in April and the 13-song Rock covers record Under The Covers in May. She will return to The Pageant nightclub in St. Louis on October 15 to record a live version of her original multi-platinum Here For The Party. The CD and DVD, entitled STILL Here For The Party, will be released in May, 2014 to commemorate the original cd's 10-year anniversary. Gretchen is currently featured in the ESPN telecasts of the 10 races in the Chase for the NASCAR Sprint Cup, which began Sunday, Sept. 15. She narrates and appears in the opening teases of the telecasts of the 10 races, with each episode tailored to the racetrack hosting that week's event. In addition, her music will be featured through the entire Chase for the NASCAR Sprint Cup on ESPN.